PLEASURES perfume was launched by Estee Lauder in 1995. 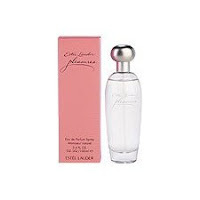 PLEASURES ESTEE LAUDER is an intensely feminine fragrance with blends of white lilies, violets and black lilies. Embraced with patchouli, peony, and gardenia. PLEASURES ESTEE LAUDER is accented with hints of moss, musk and cedar. Combine PLEASURES ESTEE LAUDER with the shower gel and lotion for a luxurious experience. PLEASURES ESTEE LAUDER is recommended for casual use. Clinique HAPPY Perfume for Women.